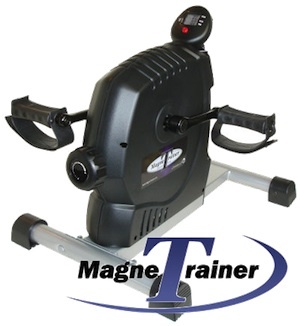 The MagneTrainer is a top of the line pedal exerciser used for home, medical rehabilitation facilities, adult assisted living homes, and in the workplace. It is also the one of choice used in rehabilitation, nursing homes, Chiropractic offices, Physiotherapy, and other commercial health settings. There are several resistance settings from very light to quite heavy. Most people never use the full range available to achieve an optimum workout. Although more robust than the simple tubular framed pedal exercisers, it is still fairly light and compact in size. The pedals sit a little higher than the MagneTrainers cousin the DeskCycle so it may be more suitable for in front of your chair rather than under a desk. The resistance is provided by a belt drive magnetic system which means you get more resistance available to you than you will probably ever need – and – its QUIET! Used in the office or at home in front of the TV you can pedal away and get a great cardio workout without bothering the people sitting next to you. With hundreds of people commenting and the vast majority of people are truly happy with their purchase. Even the negative comments have positive things to say. The steel base legs have non-slip rubber Dycem® pads on the feet so it won’t slip on different surfaces including hardwood and carpet. They measure 15 inches so you won’t get a wobbly motion when you pedal. The easily adjusted Velcro straps will keep your feet secure while you pedal too. The display screen shows time, speed, equivalent distance travelled based on revolutions, and calories burned. It requires 2 AA batteries to operate and they are INCLUDED. Arm exercise is also possible on the MagneTrainer. Although you can use the pedals that come with it, the ergonomic hand pedal attachments make it much nicer than any other mini pedal machine out there. 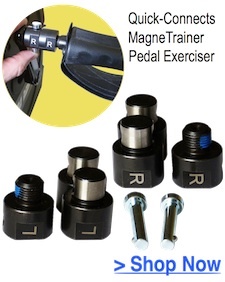 Using the MagneTrainer hand pedals will work your arms, shoulders, and back. Great for building strength and developing muscle tone. For people who have had shoulder or knee surgery, and needing rehabilitation, this may be what you’ve been looking for. Tell your Physiotherapist about it. Assembling your MagneTrainer out of the box requires only 4 simple steps. It will take about 10 minutes before you get on your way to pedalling. The price may be more than their closest competitors but 3D Innovations are providing top quality equipment, service, and warranty. 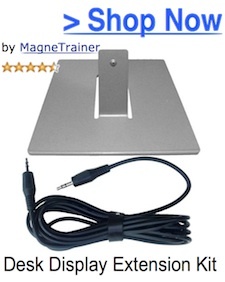 Nothing about the MagneTrainer or ANY of their products is cheap. For all the benefits and features that come with this mini pedal machine, it is actually underpriced. The patented, adjustable magnetic resistance design makes it smooth and quiet to operate and provides around 3 times the resistance of their competitors. There is a wide range of resistance settings too that allows for everything from easy cycling to a full out cardio workout. The components in the drive are made to perform and last. With 4V belts and a flywheel you can pedal this machine at high speed and it won’t wobble. Made to pedal in either the forward or backward direction you can be assured of being able to exercise the muscles in front and back of your legs. This is why it is used for more than just home and office use and a favourite of nursing homes, and rehabilitation centres. 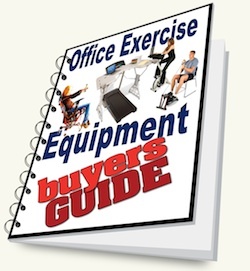 If you are looking for a machine to pedal under your desk, you might compare the MagneTrainer with the DeskCycle for desk clearance. 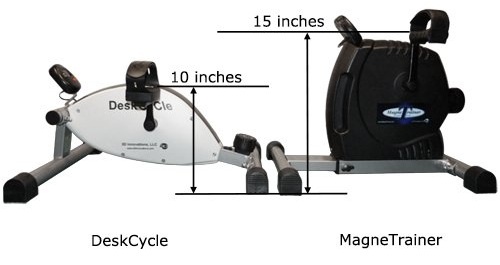 If you do have a taller desk or prefer to pedal away from your desk, the MagneTrainer may be your top choice because there is more resistance available and the pedal circumference is larger. Go here to read a more on the DeskCycle. Compact and light but still and industrial grade machine. The 15″ adjustable leg will ensure the unit will not wobble under normal use. Many desirable accessories to suit almost any need. Magnetic resistance features quiet, smooth, and several resistance settings. Offers more resistance/tension than any other pedal exerciser on the market. Adjustable Velcro straps for secure pedalling. Can be used to pedal with feet or hand cycling. Can operate in both forward and reverse directions. 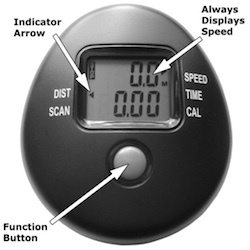 Clear to read electronic display that measures speed, distance, time, and calories burned. Although at only 23 pounds it is considered light, some people have commented they find it too heavy. Too high to use under most desks. If using with a rolling chair you may need to use the strap or locking casters. Larger Foot Pedals – For people with bigger feet or bigger orthotic shoes. Comes with adjustable Velcro straps. Quick-Connects – If you will be getting the hand pedals its a good idea to use the quick connects so you can easily switch back and forth. 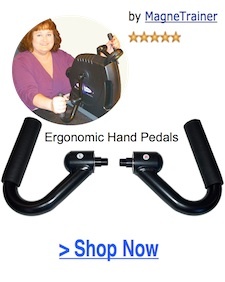 Ergo Handles – Better than using the foot pedal for exercising your upper body and doing arm pedalling. Medical Level Foot Pedals – Designed for people needing a more secure attachment to keep their feet in the pedals. 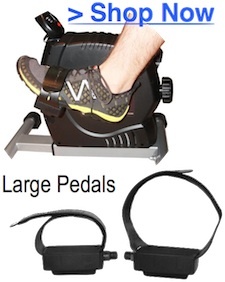 These are very helpful for people with partial paralysis, neurological impairment, muscle degeneration, or similar needs requiring your foot to be securely strapped to the exercise pedal machine. Display Stand – Great if you want to have your display set up on top of the desk. 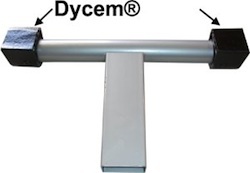 22-Inch Adjustable Leg – Use this for a more recumbent slope for the MagneTrainer. It raises the front 4 inches and gives a wider leg to reduce wobble for people having difficulty using the bike in the prescribed fashion. 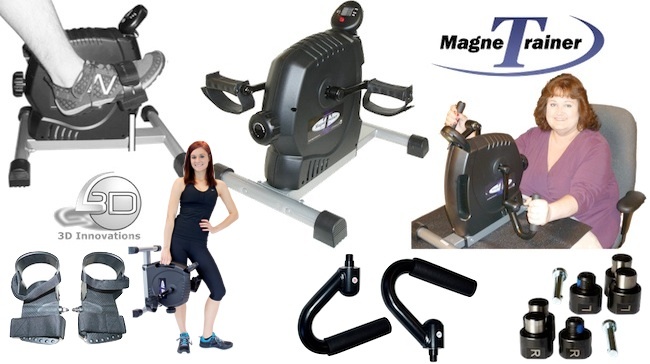 For additional group or corporate special pricing and coupon codes for the MagneTrainer please visit our store. 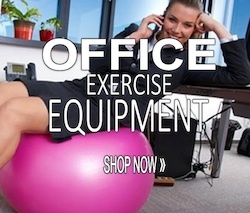 Top quality, industrial grade, mini-pedal exerciser used for both arms and legs for a total body fitness regime. Commonly found in the home, rehab facilities, and assisted living centres. The height is a little higher than the lower-profile DeskCycle but is still used in offices all over the world. Persons with limited upper body strength may need assistance to put it on a table to operate the MagneTrainer as an arm exerciser. it’s a brilliant bit of kit saved me a fortune at the posers gym i broke my leg in the army this has made my leg stronger when i got pain from it a top seller in one word outstanding.